Most of us on the computer is the Microsoft Office package. But we don't even know what opportunities in itself pose such simple programs like Microsoft Word or Microsoft Excel. 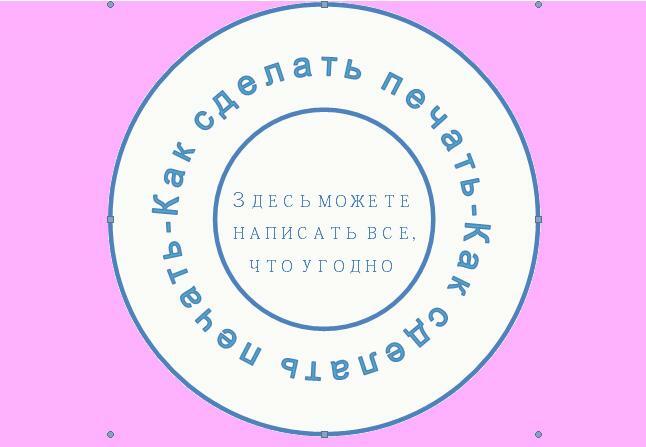 For example, using Word and you can make the round seal. So to make the print in Word 2007, first click the Insert tab => Shapes => Basic shapes => the Ring. The ring is presented in the form of a symbol consisting of a ring inside which ring smaller. You will change the cursor to a cross. Put it on a sheet and make the shape of the desired diameter. The inner ring can be adjusted independently from the outside by pulling the cursor over the yellow flag. If you have an earlier version of Word, open the Drawing toolbar => auto Shapes => Basic shapes. Subsequent actions will be similar. To make the inscription inside the ring print, choose Insert => WordArt. Choose any style that you like, write your text. If the text is short, write it several times. Between words place an asterisk. You get the normal horizontal text. Below it was written around the ring, the tab on the main menu "Format" (double-click on the figure with the left mouse button), select "Edit shape" and then select either the circle. The color of the text, you can configure the same in the tab "Format" by clicking on "shape Outline" and "Fill form". To change the text can by clicking on the button "Change text" tab in the "Format". Customize the size of the text in the circle to the size of the ring. By right-clicking on the text, select "Format WordArt" in the "page Position" select "position before the text"
It remains to make the main text of the printing. Click Insert => Inscription and a cross which will appear, select the square box, in it write everything you need. To remove the contour of a square, right-click on the square box with the inscription and remove the outline and the fill. Combine all three objects (AutoShapes, WordArt and text), highlighting one at a time and holding clamped the Enter key. Right-click, select Group => Group. If you need to correct something, first Ungroup the objects.